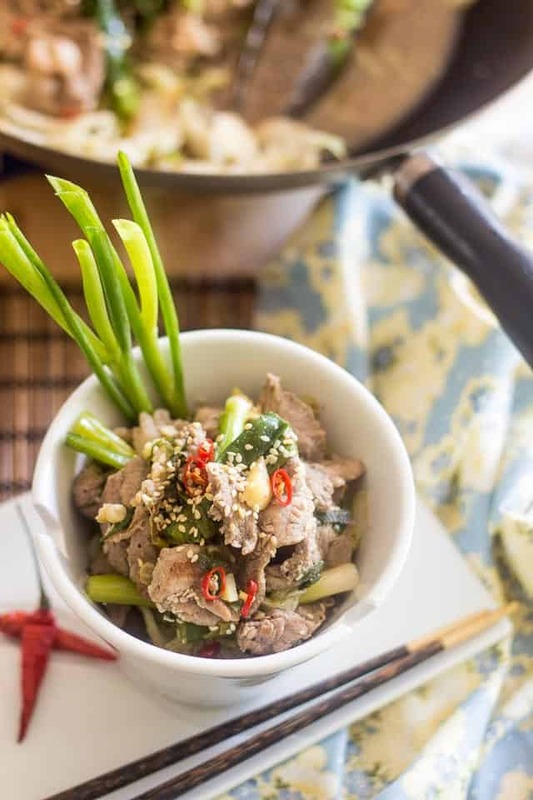 For one, I am getting more and more inspired to create dishes that include a decent amount of vegetables as well as a generous dose of healthy fat, just like this Ginger and Scallion Pork Stir Fry. Gone are the days when l felt the need to eat mayo by the spoonful at every meal to boost my fat intake. In fact, I haven’t made mayo in well over a week, which really is a record these days. For the first 2 months of my experiment, I would go through at least a batch a week, and often even more. 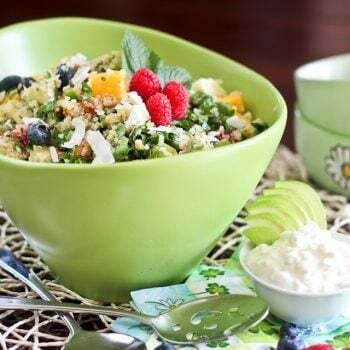 More importantly, though, I no longer feel hungry all the time… in fact, in the past week, I’ve naturally decreased my calorie intake from 2200 to around 1800-1900 calories per day, and sometimes even less. I’ve even had days when I consumed around 1500 and still felt very full and satisfied. Not that I’m really looking to create a deficit, but I’m just saying: I’ve been eating a lot less and yet, don’t suffer from this insatiable hunger anymore. 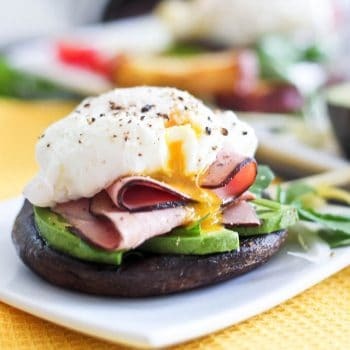 Another MAJOR advantage for me is that Keto definitely keeps me away from all forms of sugar. Since I don’t do sweeteners and since natural sugars are way too high in carbs, I can’t afford to have any.Not if I’m hoping to eat any vegetables at all, that is. 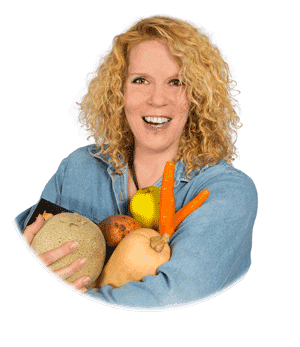 And frankly, I’d much rather eat a ton of veggies than a tiny little bit of sugar. For real! Hey, even my nut butter addiction is pretty much under control now… The jars are piling up, I seem to be making new batches faster than I can get through them, which is not a bad thing me thinks. And I even give lots of them away… I just make ’em, taste ’em and be rid of ’em. No use letting them go bad in my pantry, let someone else enjoy the goods! I think you’ll agree with me in saying that this stir fry contains a decent amount of vegetables. Obviously, I opted to use a fatty cut of meat (didn’t want to eat no mayo with this dish, thank you!) 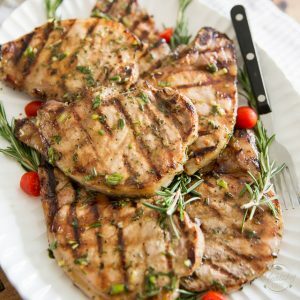 but you could very well use the leaner pork loin or even tenderloin if you wanted to. Heck, you could even use beef, or even shrimp, why not? You won’t hurt my feelings! 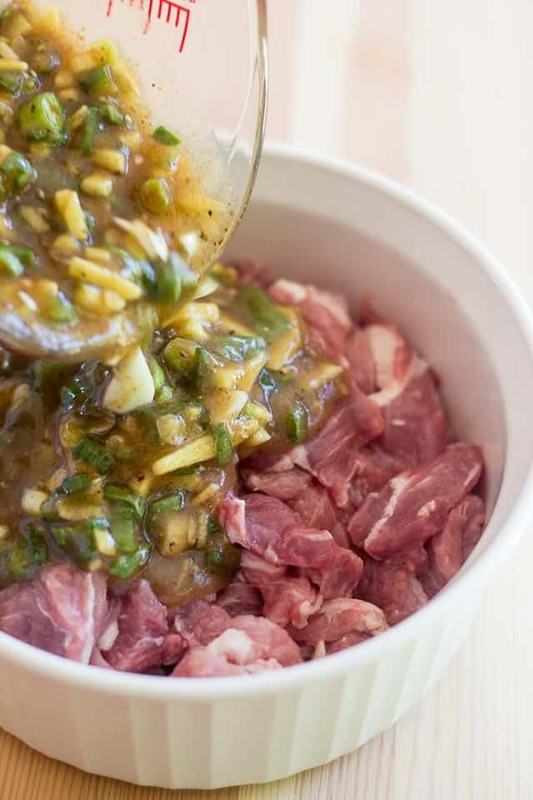 Alright, so regardless of the type of meat you decided on using, start by making the marinade, then place your meat strips into a large non-reactive bowl or resealable plastic bag and pour the marinade right over it. 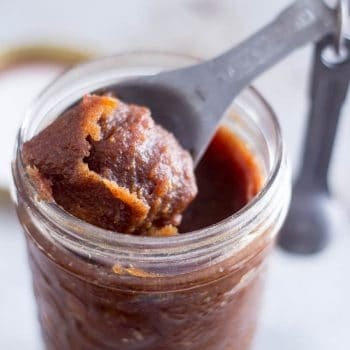 Toss with a spoon until the meat is completely coated and if time permits, cover and place in the refrigerator to marinate for at least 6 hours or better yet, overnight. If you’re in a hurry, you could use this right away… however, the meat won’t be as tender and tasty. But it’ll still be good, I swear! 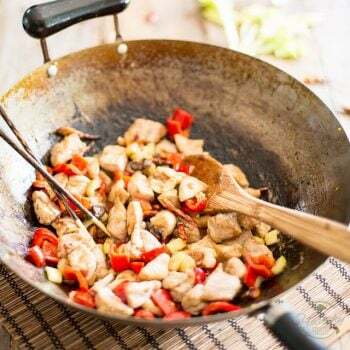 Preheat a wok or other large skillet that can handle some serious heat over the highest possible heat. 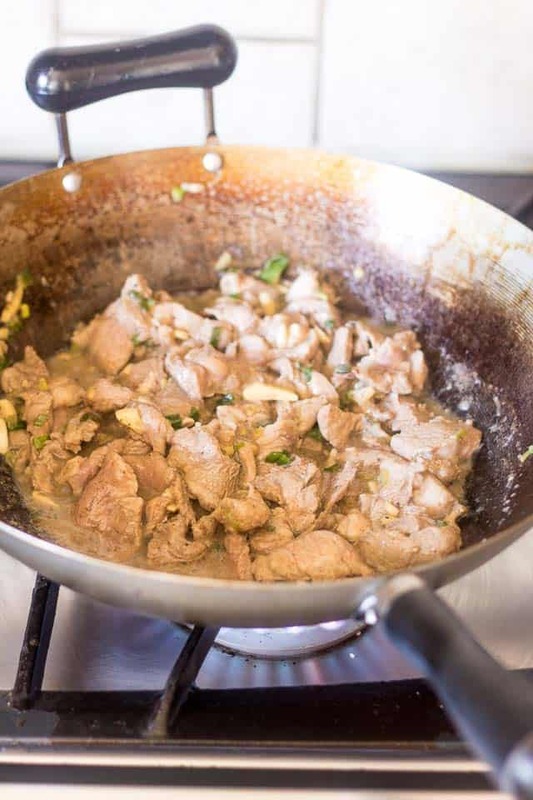 When your wok is blistering hot, add the meat and marinade to it and cook until the meat is no longer pink, about 4 to 5 minutes. Don’t overcook your meat here, you wouldn’t want it to turn super tough on you. And you’re not looking to brown the meat either… as soon as it’s no longer pink, it’s good to go! 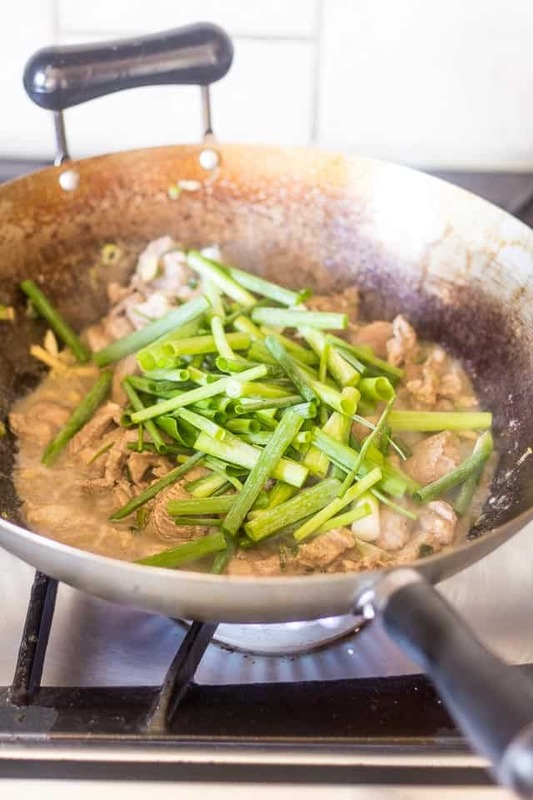 Add the green onions and continue cooking for about 30 seconds, just to soften up the scallions a little bit. 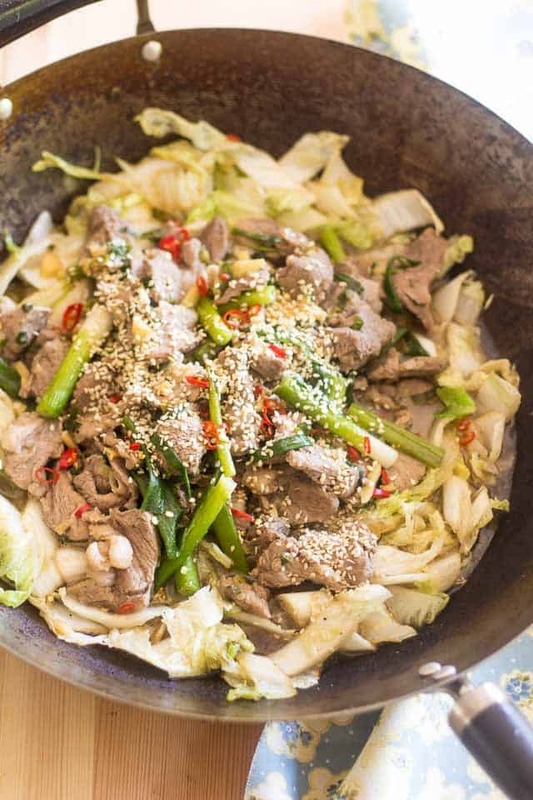 You’ll want to reserve this to a bowl and put the wok back over the heat source. 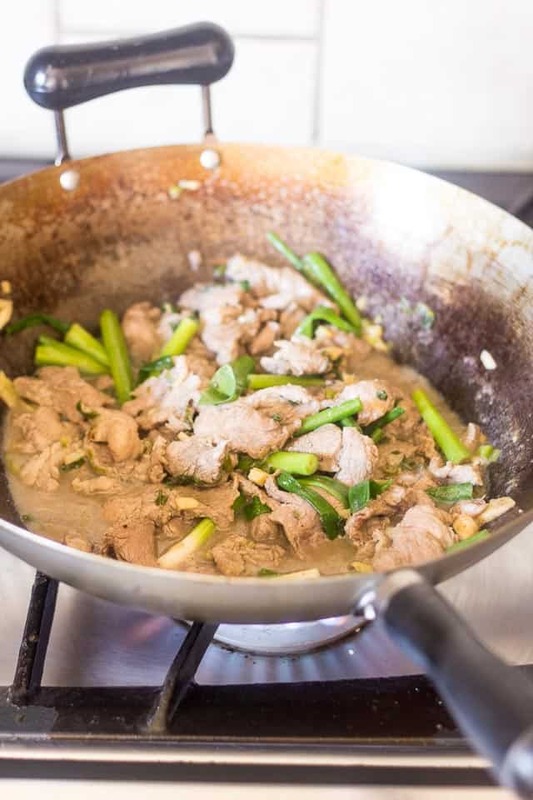 Notice how there is a fair amount of liquid at the bottom of this wok. 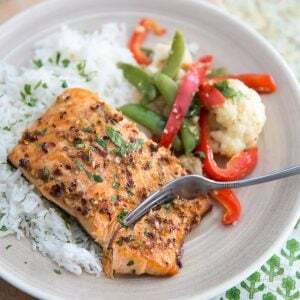 If you wanted to turn this in to a thicker sauce, and didn’t mind the extra few grams of carbs, you could add a couple of tablespoons of tapioca starch to your marinade, which would take care of thickening this sauce for you. 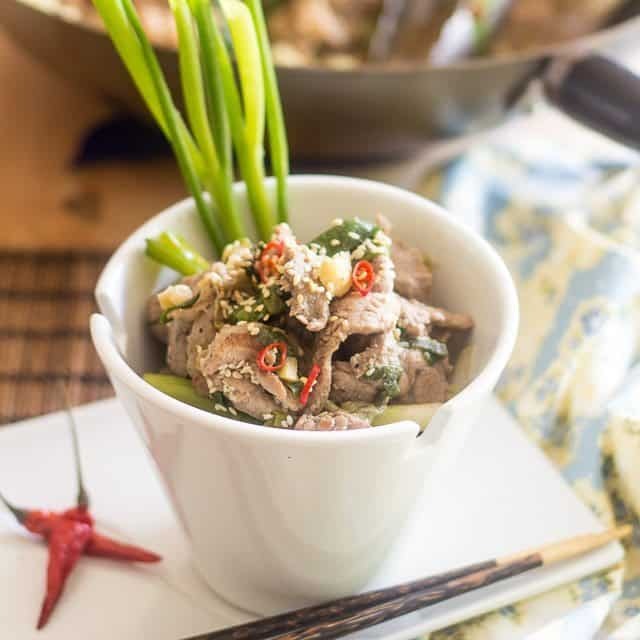 Another option would be to mix the tapioca starch with a few tablespoons of water and mix it right in before to add the green onions. That would no doubt give you a thicker sauce, also. 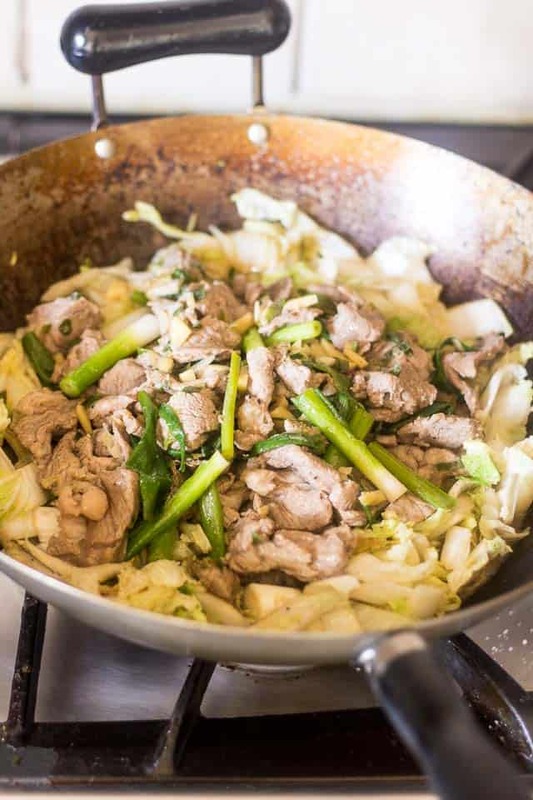 Once the meat has been removed to a bowl, throw the chopped cabbage right into that wok, sprinkle with a little bit of salt if you want (as you can see, I elected to salt mine), and cook quickly for about one minute, until barely wilted. 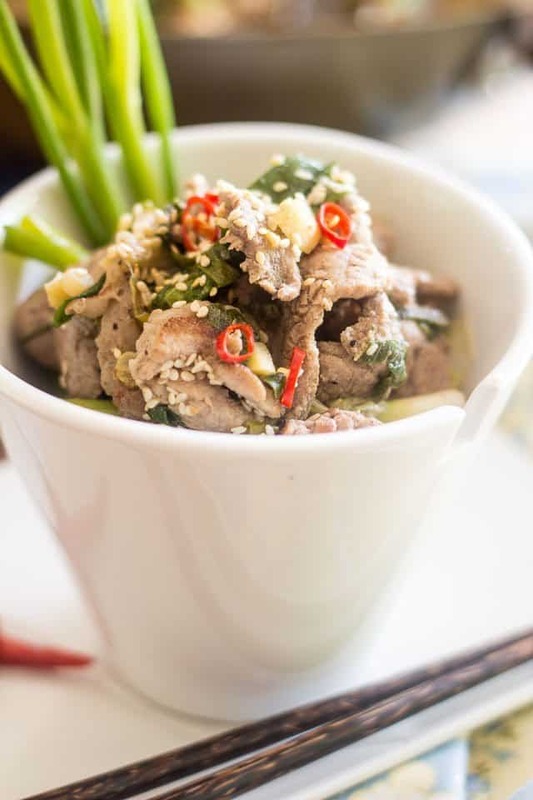 … then sprinkle with toasted sesame seeds and chopped birds eye chili peppers and serve while still piping hot. For a little bit of extra flavor (and additional fat!) 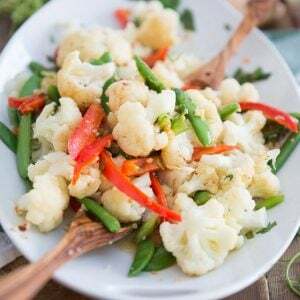 you could add a few drops of toasted sesame oil on top of your stir fry. Don’t go overboard with this though: this stuff is extremely potent! 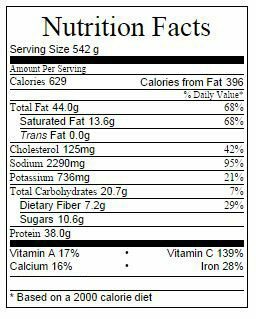 In a large measuring cup or mixing bowl (preferably one that’s equipped with a spout) add all the ingredients listed under “marinade” and mix until well combined. 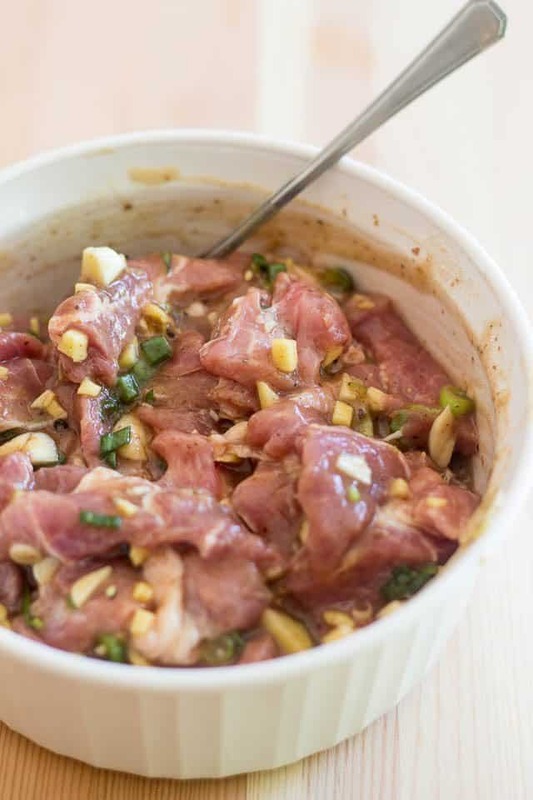 Place your meat strips into a large non-reactive bowl or resealable plastic bag and pour the marinade right over it. 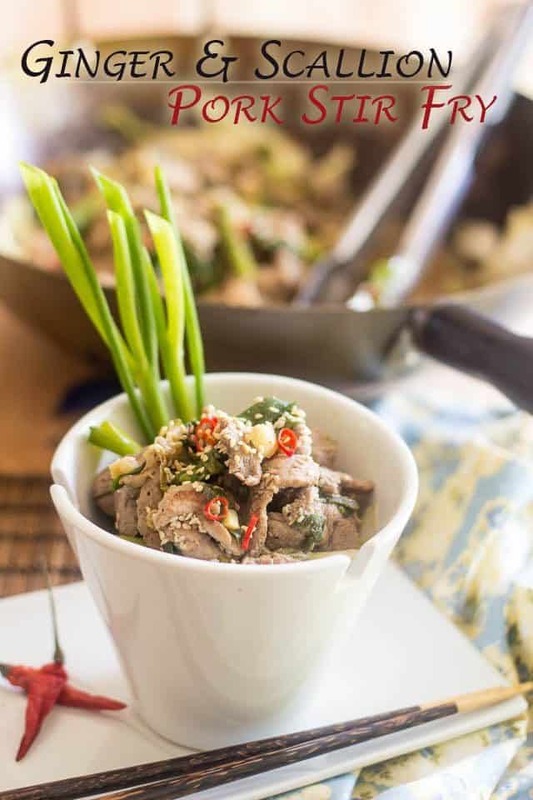 Toss with a spoon until the meat is completely coated and if time permits, cover and place in the refrigerator to marinate for at least 6 hours or better yet, overnight. Reserve to a bowl and put the wok back over the heat source. 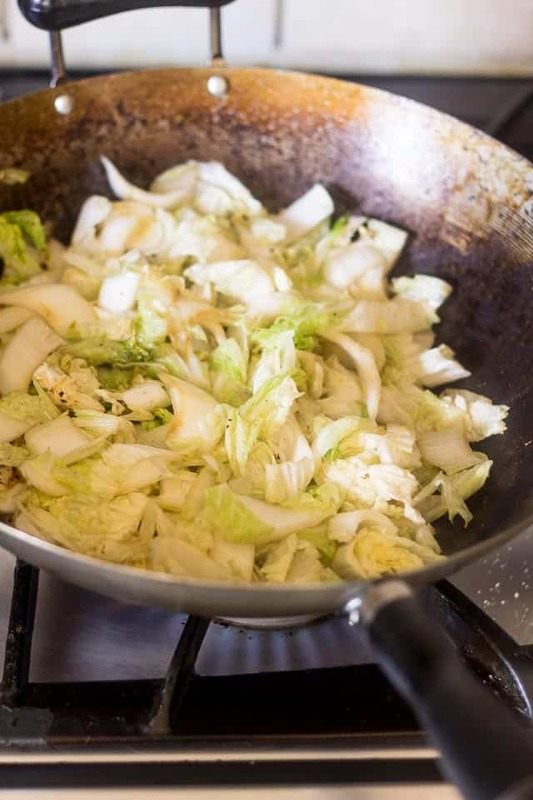 Throw in the cabbage, sprinkle with a little bit of salt if desired, and cook quickly for about one minute, until barely wilted. 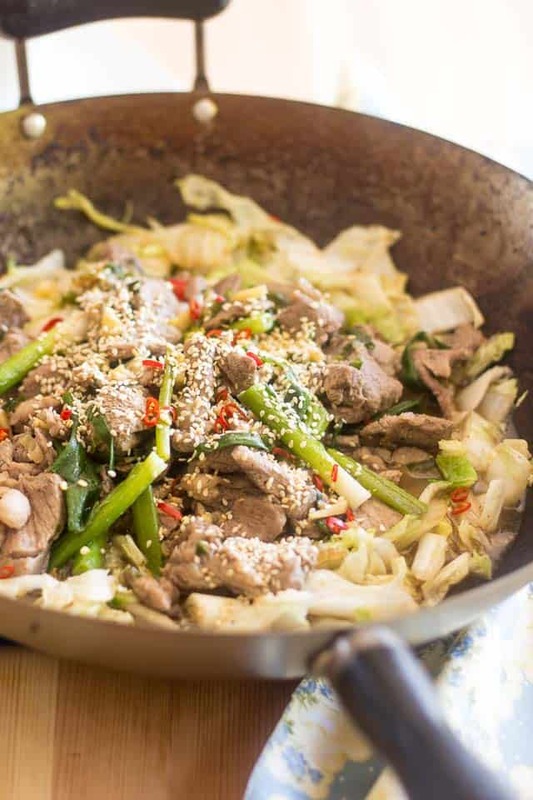 Transfer the meat and scallions back into the wok, sprinkle with toasted sesame seeds and chopped birds eye peppers and serve. I seriously do not cook enough stir fries.. thanks for reminding me how yummy and awesome they are. 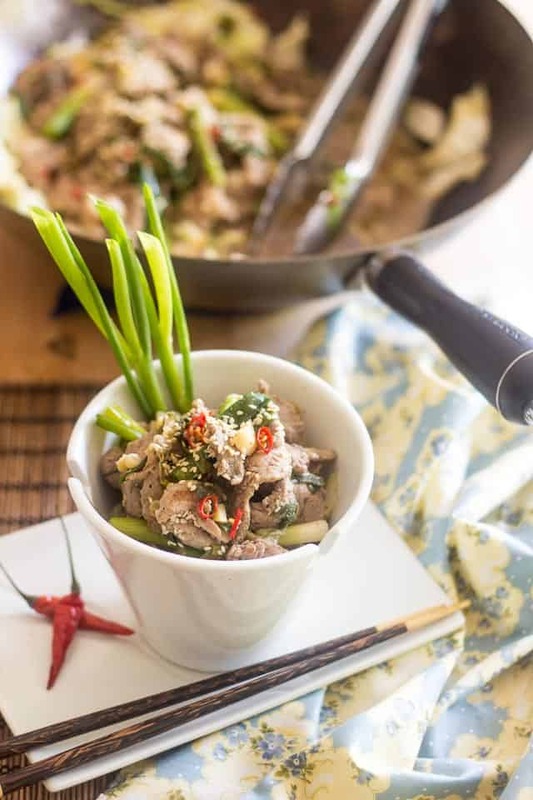 Will be recreating a version of this pork stir fry tonight! This really does sound delicious. I already printed it off to make soon. 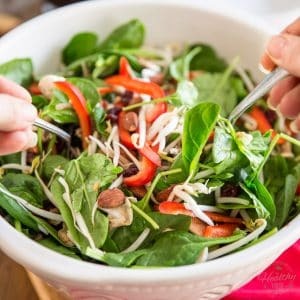 You actually have me considering Keto.